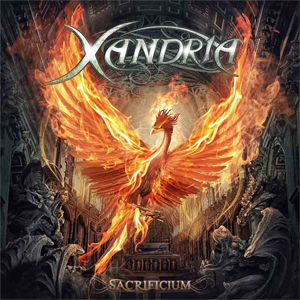 Following the release of the predecessor "Neverworld’s End" and numerous sold-out shows, XANDRIA finally releases the anticipated new album Sacrificium on May 2nd (local release dates may slightly vary). The album's first single featuring the new star in female fronted metal, Dutch singer Dianne van Giersbergen, is called "Nightfall" and is video-premiered TODAY right HERE. Sacrificium's very first spin presents the listener with a bombastic Symphonic Metal set filled with passion and sweeping vocal lines. The new vocalist Dianne delivers a breathtaking performance and gives each and every song on the album the right character and mood. The perfectly arranged orchestral parts form the perfect symbiosis with the Metal elements and are crowned by a crystal-clear production. Sacrificium will enthrall the listener with each and every second, and will let XANDRIA’s star in the Symphonic Metal sky shine even brighter. A little teaser/preview of the album can be checked below. Sacrificium will be available as Mediabook edition (incl. Bonus CD, bonus track + instrumental versions), boxset (incl. Flag, jewelry and media book), regular jewel case, 2LP vinyl (in both, orange and silver, including bonus track) and as download. The band will tour all May long, promoting Sacrificium before hitting the festival summer. In early September, the band will set sail for their first 1.5 month long US and Canada tour alongside label mates DELAIN, supporting SONATA ARCTICA. All dates and more info to be checked at xandria.de.